South Africa's new president Jacob Zuma will be inaugurated today, but it is unclear who his first lady will be. 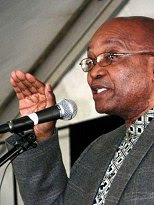 Zuma, a 67-year-old Zulu traditionalist, is about to become South Africa's first polygamist president. Confronted with the first lady question, spokesmen for his party, the African National Congress, have typically declined to respond or noted that the constitution does not touch on the issue, thus allowing Zuma to choose or alternate. The party, in fact, had stayed mum on just how many wives and children Zuma has -- figures that even his biographer could not nail down.